This year we celebrate our reunion in the historical town of Gettysburg, Pa. This most famous and most important Civil War Battle occurred over three hot summer days, July 1 to July 3, 1863, around this small market town. It began as a skirmish but by its end involved 160,000 Americans. Confederate causality, dead, wounded and missing were, 28,000 out of 75,000. Union casualties were 23,000 out of 88,000. Gettysburg is filled with antique shops, museums, tours of the battle field and nightly ghost tours for those so inclined. We invite you to come to Gettysburg to participate in and enjoy this time of fellowship with your fellow shipmates, friends and family. plus 9% occupancy tax, per room per night. These rates will be honored two days before and two days after event dates. Small pets, 50 lbs or less, are welcome. There is a $20 fee per night for pets. Members must make their own reservations with cut-off date May 23, 2011. Cancellations may be made 24 hours prior to the date of arrival. Late reservations accepted on a space or rate available basis. Call 1-866-845-8885, request rate for ADFA reunion. Registered guests may park RVs on the premises. The dinner will consist of a buffet with two entrees, assorted side dishes, coffee, tea, and desert. Deadline for dinner reservations June 1, 2011.  The location of the ADFA Registration Desk and Hospitality Room will be available on your arrival.  For the hearty souls a ghost walk tour is planed for Tuesday evening. Bring your walking shoes.  The reunion’s opening ceremony will commence at 9:00 AM on Wed. Because of the historical significance of this years venue, a presentation relating to the Gettysburg area followed by a bus tour of the battle ground will follow the ceremony.  All tours will be by reservation and the fee per tour will be made at the time of reunion registration.  Information on other areas of interest will be available for those who do not wish to take a scheduled tour.  As in the past, the auction will commence when you are enjoying an after dinner beverage of choice.  Contributions, of Items of interest, are always welcome.  An attachment lists numerous items that have been assembled for both the silent and live auction.  Program / Activities, in detail, will be provided at the time of registration. Looking Forward to seeing you at Gettysburg. Replicas of the plaque, as displayed, can be ordered from the USNM. They are mounted on a hardwood base suitable for hanging or exhibiting on a desk or table. Present cost, postage paid, is $125.00. After 1 Oct. 2007 the price will be $150.00. If interested contact Bill Stroup at: westroup@ aol.com and he will send you an order form. 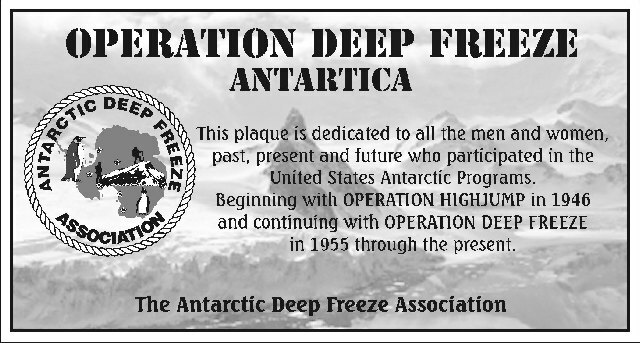 The Antarctic Deep Freeze Association was formed for the benevolence, education, recreation and general welfare of the military and civilian personnel, their families and friends, who participated with the U.S. Navy's Operation Deep Freeze on the Antarctic Continent commencing in 1955 and extending through its entirity. Any eligible person may apply to join the ADFA. There are no entry fees or annual membership dues. POLAR LINKS (mostly Antarctic) related web sites.